After the cost of your car lease, contract hire or car finance, fuel is likely to be your biggest motoring expense. While filling your car may cost as much now as it has ever done there are ways to get more from the fuel in your tank. Regular servicing helps to keep your car lean and green. You should have your vehicle checked regularly to ensure it is running as efficiently as it can. For example, under-inflated tyres can increase fuel usage by as much as 4 per cent and so it pays to check your tyre tread depth and pressure on a regular basis. Which? estimate that you can save £239 a year by keeping your car as efficient as possible. The price of fuel can vary considerably from location to location. It’s not unusual for your local supermarket to be offering petrol and diesel at up to 10p less per litre than a motorway service station. Many supermarkets have fuel promotions and offer money off your fuel if you spend a certain amount in-store. Loyalty cards such as Nectar and Tesco Clubcard can also help you to save money. 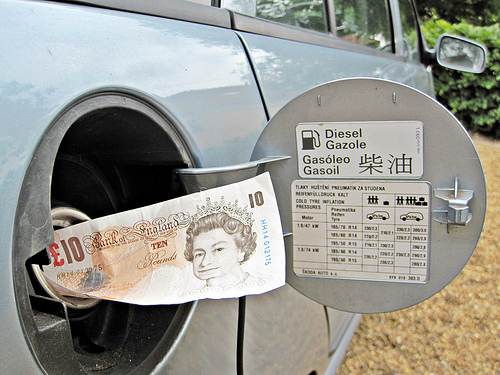 Websites such as petrolprices.com can help you compare the costs of fuel in your local area. When accelerating, changing into a higher gear earlier can help you to reduce your fuel consumption. Experts advise that you change gear at 2,000rpm in a diesel car and 2,500rpm in a petrol model. The Institute of Advanced Motorists (IAM) also advises that, if you are able to do so, you should use so-called ‘block gear changing’. This means changing from 2nd to 4th gear when accelerating from or 5th to 2nd when decelerating. The IAM say that this is more fuel-efficient than working your way through the gears. Sticking to the speed limit can help you to keep your fuel bills down and reduce your car’s CO2 emissions. A car speeding at 80mph uses 10 per cent more fuel than one cruising at 70mph, according to the Department for Transport. A simple way to save fuel is to reverse into a parking space. If you do all the manoeuvring with a hot engine you can drive straight off when you come back and warm the engine up more quickly. Always remove excess weight, including roof racks, car clutter and unnecessary items in the boot. This is because the more weight you carry in the car, and the more drag as the car moves through the air, the more fuel you’ll consume. Also consider filling up with smaller amounts of fuel more often. The petrol or diesel itself is heavy and so filling your car up adds several kilos to the overall weight of your vehicle. Slow down and take your foot off the accelerator earlier when approaching a queue, junction, roundabout or red traffic lights. The Guardian advises that rather than accelerating and braking sharply on roads with speed bumps, you should drive at a steady 15mph-20mph instead. This entry was posted in Advice and Guides, News and Views and tagged fuel economy, green driving, saving by David Petherick. Bookmark the permalink.